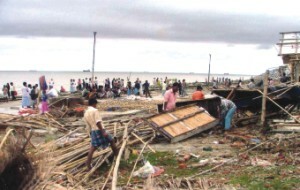 It is easy to say that cyclones are part and parcel of living in Bangladesh. The statement is easy to make because I personally have not had to live through a one. While they batter and bruise the south of the country I, like millions of others, sit in the comfort of my home and watch coverage of the 'event' on TV. It is sad to say, but when SIDR occurred, while I sympathised with what the people of the south went through, I could not empathise with them. I could not truly say, I felt what they were going through. While I donated money and channelled my prayers towards their well-being, I could never truly understand their pain and suffering. All that changed last week, when for a few hours, I visited Sharonkhola a year after SIDR and saw first hand how fragile life is on the edge of Bangladesh. 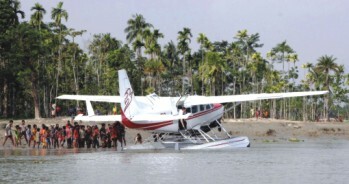 The opportunity arose when the Department for International Development (DFID) chartered a plane to Sharonkhola to check up on their post-SIDR related activities. I took one of the empty seats on the plane in the hope that finally going down there would help me understand the situation better. The trip by seaplane was a first for me, and the sight of Bangladesh from the air was something I will not soon forget. To see our nation from the air is to fall in love with it again. The endless greenery and winding rivers make up the contours of a land that most of us will never see. As we neared our destination, the landscape changed just a little, the trees thinned out a little and the closer we got to the ground, the easier it was to see that the land had suffered tremendous trauma. As we landed what seemed like a hundred children lined up on the embankment, excited and happy, merely to see the plane. We got off the plane and were met by Swapan Guha, the Chief Executive of Rupantar, and organisation that acts on the ground in areas such as Sharonkhola to help donors effectively use and distribute their relief material. Chris Austin, the country representative of DFID, led the way into the small village of Bogey where he wanted to look up a friend. With a cricket bat tucked under his arm and a box of tennis balls, Austin met up with Shohag a nine-year-old boy who lost his entire family to SIDR. Shohag's face lit up to see Austin, and before one could say 'play' they broke into a game of cricket. It was amazing to see young Shohag, having lost everything to the cyclone, was still happy with the little things in life. His strength reverberated through the village, as no one was willing to let Mother Nature dictate their lives. As we walked with Shohag towards his school, where the bat and balls were to be kept for safekeeping and so that the rest of the children could play with them, I overheard whispers of who bad lost what in the cyclone. Some had lost livestock, other bad lost homes and almost everyone had lost a loved one. The stories of survival were endless and had I not heard them first hand, they would have just become more stories related to the incident that I could not identify with. Hearing about losing one's family to Mother Nature is one thing and seeing the pained expression in one's eyes when talking about it is another thing altogether. The stories were no longer just words, they unnervingly became real. As we reached the school I realised that there must have been at least 5 different aid agencies as the sparkling new houses that dotted the village all bore plaques identifying which agency helped build and provide them. For a village as small as Bogey, there were far too many agencies doing similar work. Quite obviously there was a lack of planning and more importantly, co-ordination. Logically one aid agency could have taken care of the village and the others could have moved on to other places which were affected just as badly. After the school, we met Mumtaz Begum who received Tk 15,000 after the cyclone, after she lost her house and means to earn an income. Her's is not a success story and highlights the realities of the hardship people face during the rehabilitation process. Her husband is too old and sick to fish again, so Mumtaz invested her money into a fishery which did not work out well for her. She lost almost all the money given to her and will not receive funds again, her last shot at success was met with a crushing failure. While aid agencies and the government will always provide the public at large with success stories, the stories of failure are all too real to gloss over. They are the real stories of the inheritance of loss. Every few years a cyclone wrecks their lives and livelihoods and every few years for every success story there are countless other failures, yet from what I saw the people never lose their strength. Their indomitable spirit is the hallmark of their very existence on the edge of Bangladesh, where climate change and humans meet face to face. Finally I learned not to sympathise with them or even empathise with them, but to salute them.